Kmart in an Australian-based chain of discount stores with 189 stores currently in operation across the nation. 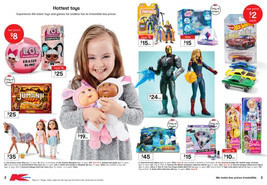 Shop online at Kmart to browse the latest weekly ads and catalogues for the best deals on furniture, bedding, toys, clothes, kitchenware, electronics, and more! 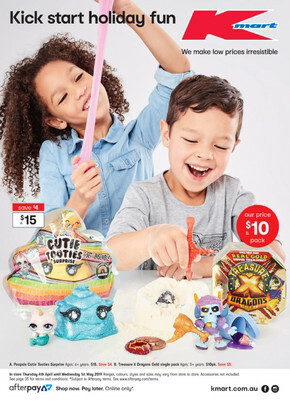 Kmart guarantee everyday low prices on your favourite products and brands. And to make sure you’re 100% happy with your purchases, they also offer 28 day returns. With their Price Promise, Kmart will match the advertised price on any product if you find an identical stocked item at another retailer. Shop now! Give your loved one the freedom of choice for any special occasion with a Kmart Gift Card! Choose between Gift Cards valued at as little as $5 or as much as $500, and with Kmart’s irresistibly low prices their gift card is guaranteed to go a long way. Visit Kmart online to check your Gift Card balance today. For all the information you need on store locations, opening times, and to browse the latest flyer, visit the Shopfully website or download the app.